Facebook recently implemented some changes and is now a publicly traded company. We’ve sorted through the news, updates and reactions to help you find out what you need to know about Facebook in 2012 and how to reassess your social media goals. Don’t have a strategy? Working with a shoestring budget? Keep reading for fresh ideas in this three-part series. Timeline. The revamp had many individuals up in arms over yet another privacy grab, but this newest tool is a huge asset for brand pages. The large cover photo is a visual way to set the tone of your organization, and unlike landing pages, can’t be used for advertising. This encourages organizations to use other, more engaging methods to connect with their audience, rather than through a static first page. The page for Philadelphia is a great example. Timeline is also a great way to introduce new and exisiting fans to the history of your organization by highlighting key moments and pinning important notes to the top of your page. Photos are also posted on a large scale- a reminder that images are exponentially more interactive and attention grabbing than status updates alone. Use this new change as a reason to comb through your organization’s vault of photos, updates and events and bring these memories front and center to your audience. Timeline’s biggest advantage is the way it increases our ability to learn more about each other, which increases engagement and interaction. This may be a mixed bag for the private citizen, but perfect for an organization looking to maximize awareness and generate reach. Speaking of engagement- have you found the Insights section yet? It’s always been there, tucked into the side bar of your brand page. Now it’s in the center of your Admin Panel at the top of your page- and you should really spend some time with this data. When you’re logged in, click “See All” in the Insights box to go to the Insights page and then click “Export Data” for a complete spreadsheet. This spreadsheet easily tells you everything you need to know about your audience. 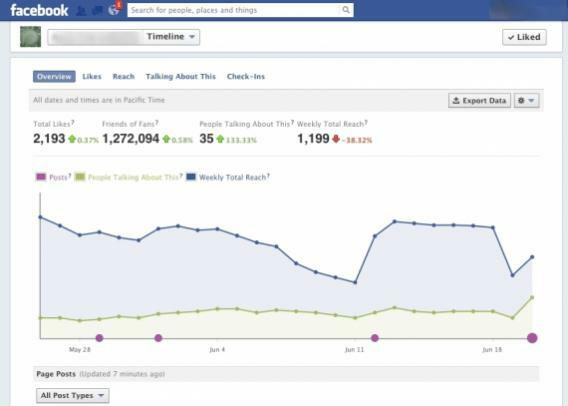 How many times is your page seen by how many people per day/ week/ month? What age demographics are you reaching? What type of content is connecting most with your audience? It takes some time to page through all of the information, but it is well worth the effort. Click around to customize the data you’re looking to find. These insights are important when deciding what goals your social media campaign needs to achieve. Are you trying to expand awareness for your organization? Are you trying to sell tickets to your event? Do you need to reach a target audience that is different than your existing audience? These goals can be achieved with two different approaches: advertising and marketing. We’ll explain the difference in our next post, and we’re happy to take your questions in the meantime. How did you react to Timeline? Do you notice a change in the way users interact with your page?